The VA home loan program was created more than 70 years to provide affordable home-ownership to U.S. military veterans. Updated: six new VA cash-out refinance guidelines and requirements for 2018. NSH Mortgage has the knowledge and tools that can help you discover how much you can save on a VA cash-out refinance loan during 2018. To date, over 22 million current and former members of the U.S. Armed Forces have taken advantage of a VA mortgage. The loan provides zero down home buying and never requires mortgage insurance. But the program extends beyond helping the home buyer. It helps the homeowner, too, by offering the VA cash-out refinance option, with which the eligible veteran can tap into their home equity and receive cash back for any purpose. Like all VA loans, the program requires no mortgage insurance, even though any other loan type on the market requires it for loans with less than 20% equity. The VA cash-out loan is the only refinance available today that permits cash to the borrower with a loan to value of 100%. For veterans, this loan could be the best way to put home equity to work to complete long standing financial goals. Rates are low, and approval is easier than for standard cash out programs. What Is A VA Cash-Out Refinance? The VA home purchase mortgage. The VA streamline refinance also known as the Interest Rate Reduction Refinancing Loan or IRRRL. Receive cash back at closing of the loan. A VA streamline refinance allows a loan size only big enough to pay off the existing loan and pay for closing costs. Additionally, the veterans must have a current VA loan already. The cash-out option, though, allows the veteran to open a loan amount up to 100% of the home’s value, receiving cash back to use to pay off other debt, buy a car, pay for home improvements, or any other purpose. For example, an eligible veteran or homeowner owns a home worth $200,000. Her existing loan balance is $150,000. She can open a VA cash-out loan for up to $200,000 and receive $50,000 at closing, less closing costs. The VA cash-out loan is an excellent tool with which veterans can raise large amounts of cash quickly. Cash is not the only reason to open a VA cash-out loan. In fact, the name for this loan is a bit misleading. The VA cash-out can pay off and refinance any loan type, even if the applicant does not plan to receive cash at closing. The veteran can first, they can pay off a non-VA loan, secondly, they can get cash at closing, or finally, they can do both simultaneously. The VA streamline loan, rather, is a VA to VA loan program only. In addition, because VA loans do not require mortgage insurance, veterans can reduce their home-ownership costs by paying off a FHA loan and canceling their FHA MIP. Likewise, the veteran homeowner can refinance out of a conventional loan that requires private mortgage insurance (PMI). Here is an example. A veteran purchased a home with a FHA loan in 2016. The outstanding loan amount is $250,000. The FHA mortgage insurance costs are $175 per month. The veteran can use a VA cash-out loan to refinance the FHA mortgage into a VA one even if he does not want to take additional cash out. The veteran now has a no mortgage insurance loan and, potentially, a new lower rate. An Alt-A loan with a high interest rate. First and second mortgage combo piggyback loans. Any loan that requires mortgage insurance. In short, you can pay off any home loan, regardless of the type of loan it is. The housing downturn happened nearly ten years ago, but many veteran homeowners are still feeling the effects. Tens of thousands of homeowners nationwide are underwater on their mortgages, meaning they owe more than the home is worth. 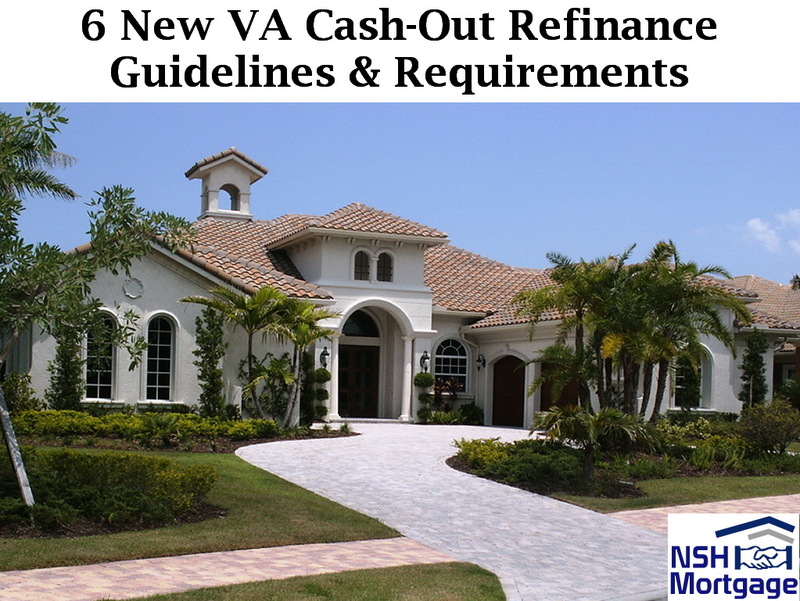 The good news for veterans, anyway is that the VA cash-out refinance can be opened for up to 100% of the home’s value. The VA program can refinance a loan to a lower rate even if the homeowner is nearly underwater. For instance, a veteran received a non-VA loan for $200,000 at an interest rate of 6.5%. Home values dropped, and she was unable to refinance into a conventional loan. As an eligible veteran, she opens a VA cash-out loan for 100% of the home’s current value, paying off the high interest loan, and reducing her monthly payment. The popular HARP program was created to help underwater homeowners, but it is only available to those with Fannie Mae or Freddie Mac owned mortgages. The VA cash-out loan is a HARP alternative because it allows eligible veterans to refinance no matter who owns the current mortgage, and even if they owe nearly as much as their home is worth. Lenders do not require any equity in the home to use a VA refinance. VA cash-out loans require documentation similar to that required for a VA home purchase loan. A new appraisal is required to establish current value of your home. You will also need to provide income documentations like pay-stubs, W2s, and, potentially tax returns. Bank statements may be required, as well as an itemized list of debts to be paid off with loan proceeds. The lender will verify that your income is enough to pay the new VA loan payment. VA lenders typically allow a debt to income ratio up to 41%. That means your new home payment plus all other monthly debt payments can use up as much as 41% of your before tax monthly income. Notably, VA cash-out loan requirements are more stringent, so you should choose a VA streamline if you have a VA loan currently, or do not need the cash out. VA’s streamline option does not require an appraisal or income verification. You served 90 days in wartime and are now separated. 90 days and are still on active duty. 181 days in peacetime and are now separated. Two years if enlisted in the post-Vietnam era. Six years in the National Guard or Reserves. Or, if you are a surviving spouse. Eligibility can also be established for any service-persons. VA approved lenders can check eligibility, often within minutes, through direct online requests to VA. If you have any U.S. military experience whatsoever, it is worth checking your eligibility for a VA loan. VA cash-out loan limits match those of VA home purchase loans. In 2017, the standard VA loan limit is $424,100 for an one-unit home in most areas of the country. Some high cost areas permit larger maximum loan limits, up to $721,050. Always remember, that VA loan limits are only the limit on which VA requires zero equity in the home. You can open a larger VA cash-out loan than the stated VA maximum. You can do this by maintaining a home equity equal to 25% of the loan amount that exceeds the local limit. For instance, the local limit is $424,100 and you open a VA cash-out refinance for $524,100. You will need to retain at least $25,000 in home equity to qualify for the loan. Most homeowners, though, do not require VA loans over the local limit. In fact, according to 2016 data from VA, the average VA refinance loan was just over $250,000. Borrowers can use cash out from their homes at the same time they combine first and second mortgages into a single low cost VA loan. That is true even if the current mortgages are not VA loans. For example, a veteran purchases a home with a FHA loan then later receives a second mortgage from a local bank. The eligible homeowner can pay off both loans, eliminate mortgage insurance, and consolidate both loans into one. If there is cash left over, the homeowner can cover medical bills, manage a family emergency, start a business, or pay off any high interest short term loans.